Thanks for visiting Tipsy Graphics! 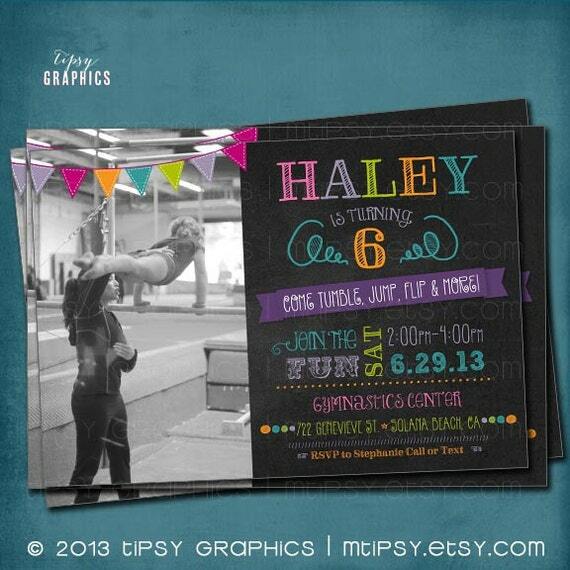 This listing is for a digital print-yourself Gym or Bounce House Invitation Photo Card at your favorite print shop. A high resolution, totally customized 5x7 jpeg of your invitation sent via email. Attach the PHOTO in an email to (TipsyGraphics@gmail.com). 5x7 jpeg will be sent unless specified otherwise. I’ll email you a high resolution file within the time frame as noted on my shop homepage after payment and all information is received. Review the file(s) for any errors or changes. Once everything looks exactly the way you'd like, print as many copies as you'd like. The printable files are designed to be printed on white cardstock or photo paper from a home printer, at a photo lab (anywhere you'd print your photos like Walmart or Target) or a print shop (like Staples or Kinkos). Love this invite but want to change the wording, the colors, or the occasion? No problem! Send a convo to discuss the details! The files and templates are copyright of Tipsy Graphics and are for personal use only. By purchasing this listing you are agreeing to my current turnaround and shop policies. He or She. Gender Guess Baby Shower Raffle Tickets by Tipsy Graphics. Bring a Book. Diaper Raffle. DiY Printable File. Top Gun Inspired Fighter Jet Birthday Party Invite with Photo by Tipsy Graphics. Any colors and text.